After all of the head-spinning votes, speeches, delays and challenges on the floor of the Erie County Legislature, lawmakers ultimately voted 10-1 on Thursday to approve Democratic lawyer Mark Carney as the newest commissioner on the Erie County Water Authority. The vote came after repeated and impassioned pleas by Amherst Democratic Legislator Thomas Loughran to delay naming a new commissioner for 90 days. He later expressed disgust and outrage that some members of the Legislature minority voted against his proposed moratorium after they initially committed their support for it. "That is such a joke," said Loughran, the only lawmaker to vote against Carney. "The bottom line is that this is a victory for the party chairmen." Those who supported Carney's appointment, however, said Carney pledged to support greater transparency as one of the authority's three commissioners. They also said he has the experience to reform the Water Authority. It made no sense to allow a current commissioner, Republican Water Authority Chairman Robert Anderson, to keep his seat when he is one of two commissioners who voted in favor of giving the authority's executive director, Earl Jann, a three-year employment contract that makes him too expensive to fire, supporters said. "I believe Mark has not only strong credentials, but he had the resolve and strong management and leadership experience needed to make major changes at the authority," said Chairman Peter Savage, who put Carney's name up for a vote. All of the Republican legislators expressed support for the Loughran's proposed moratorium Thursday morning. Loughran also said he had the support of Minority Leader Joseph Lorigo, C-West Seneca, who previously gave no indication he would vote against it. A few hours later, Savage announced he would send Loughran's moratorium proposal to committee. Loughran challenged the decision, and both Lorigo and Legislator Edward Rath III, R-Amherst, declined to support Loughran, effectively allowing the moratorium proposal to die. "Obviously, I'm frustrated today because I thought we were going to bring an abrupt halt to this culture of corruption," Loughran told colleagues on the floor. Lawmakers voted 7-4 against Loughran's moratorium proposal. In addition to Loughran, the three legislators who supported his resolution were Lynne Dixon, I-Hamburg; Kevin Hardwick, R-City of Tonawanda; and John Mills, R-Orchard Park. Rath said he changed his mind after receiving a legal opinion from the lawyer for the Legislature's Democratic majority a short time before the Legislature session started. The opinion indicated the moratorium would be illegal and in conflict with state law, which governs how authority appointments are made. "When we have the unanswered legal questions, I cannot vote with a clear conscience before knowing whether something is legal or illegal," he said. Lorigo, meanwhile, said he always knew Loughran's resolution was a violation of the county charter. He said he never told Loughran he would support the moratorium, even though Loughran recounted a conversation he had with Lorigo the previous day that reassured him he had Lorigo's backing. Loughran questioned why some members of the Republican-supported minority were accepting the legal opinion of the lawyer for the Democratic majority. He also said the only reason Republicans wouldn't jump at the opportunity to keep Anderson – their Republican appointee – in his seat a little longer is because both parties benefit from the political patronage system that exists now. 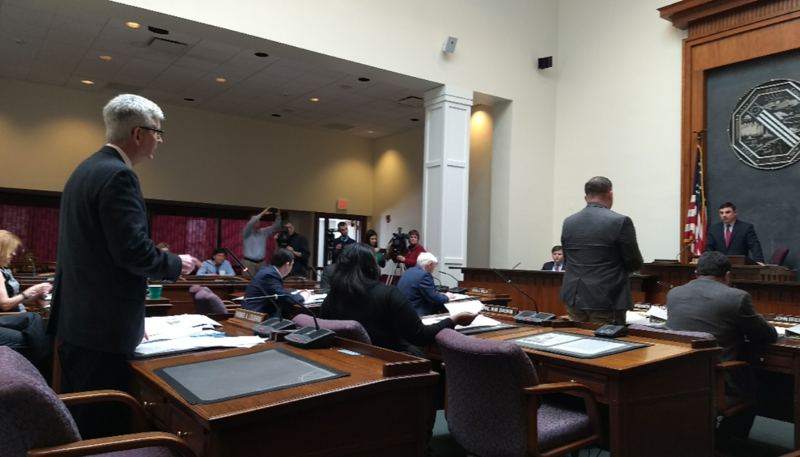 Legislator Patrick Burke, D-Buffalo, who is running for State Assembly, said he was offended by Loughran's attempt to paint legislators as complicit in a corrupt system when all sides agree reform is needed. "I'm sick of it," he said. Burke attributed Loughran's comments to sour grapes over not being chosen as Legislature chairman at the start of the year. Burke also said that when Loughran was chairman of the Energy and Environment Committee, he allowed a proposal to abolish the Water Authority to languish and die under his watch.